The Raspberry Pi is also suitable as a file server in some ways. So a kind of hard disk or data storage in the network. There are various possibilities of realization, which have all their advantages, but also disadvantages. Raspberry Pi is basically not suitable for its hardware equipment as a file server. In addition to enough computing power, a corresponding connection for storage devices is missing. The architecture and the internal connection of the network interface and the USB is not really suitable for this. Better would be a mini computer with a SATA connection. If you do not expect speed miracles, then you can of course set up the Raspberry Pi as a file server. Identify the possibilities and make a decision. Set up the file server. Access it via Windows Explorer. Save a file on the server. FTP is an old and insecure protocol for file transfer. There is really no reason to run an FTP server. Many solutions are based on the installation of an FTP server, such as ProFTP or vsftpd. But that is not necessary. If the remote access works via SSH, you do not have to do anything more than establish an SFTP connection to the SSH server with an FTP client. NFS is the abbreviation of "Network File System". This is a service that releases or exports directories on a server to other computers over the network. Other servers or clients can mount these directories. That is, hook in their file system. The advantage of NFS is that you can use the storage space of other computers on the network as if it were locally available. Automatically mount NFS share with "autofs"
Samba is a software solution that allows you to realize all the functions of a Windows server. 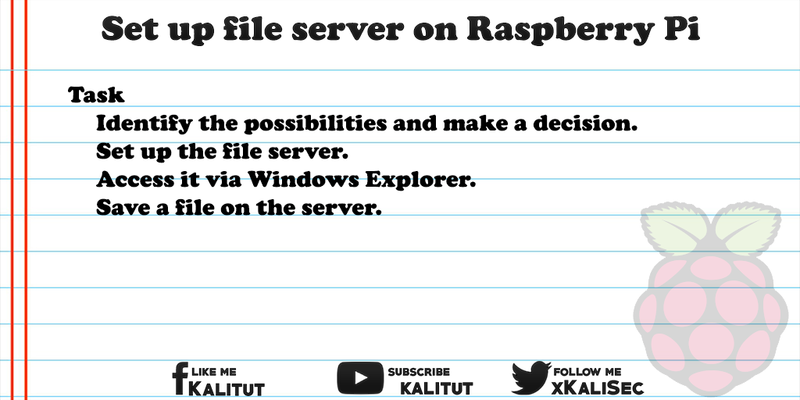 With a Samba server you can operate the Raspberry Pi as a file server, which can be accessed via Windows Explorer.